Please do not send us milkweed seeds that were purchased or seeds that came from plants that were purchased. Thank you! The Bring Back the Monarch Campaign starts with seeds and we need your help collecting them! Collect the pods, process (clean) the seeds and send them to us. * Make your own seed separator. *Request shipping label if needed. What to collect: milkweed species targeted for your region. Do not collect seeds of rare or endangered milkweeds. When to collect: ripe pods split upon touch and the seeds should be brown or “browning up.” Do not collect pods in which the seeds are white, cream colored or pale. How to collect: Be sure to obtain permission before collecting on private property or federal, state or county properties. Be safe. Wear bright clothes near roads. Do not collect along busy highways. Wear gloves. See Precautions below. LABEL a separate, sealed container for the seeds of each milkweed species. If you do not process the seeds, please contain the pods or seeds so that they will remain in the container when opened and not fly about our offices. How much? Collect as much as you can. Quantities less than one ounce of processed seed are only needed for rare species. Many pounds of milkweed seeds are needed for seed mixes used in roadside or landscape restoration. Two to four onion bags of pods will yield about one pound of seeds. Genetic diversity: Incorporate as much diversity as you can into your sampling of pods. You can do this by collecting your pods from more than one site. A. syriaca (common milkweed) forms genetically identical clones through underground rhizomes. To obtain a fair representation of the genetic diversity of this species, the pods can be collected from a number of clones scattered over several sites. Your contact info: name, address and email. The date, county, and state of the collection. Your Ecoregion. Not sure of ecoregion? Look it up, on our Milkweed Region and Seed Needs page. Notes on the size of the milkweed population, e.g. large, medium, small, one or many sites, etc., would also be helpful. Milkweed sap can damage your eyes. The initial irritation is a bit painful followed by a cloudiness of the cornea, which can take a week to clear up. You don’t want this to happen to you or anyone who works with you. Wear gloves while collecting milkweed pods and avoid contacting your face, or region of the eyes, with the gloves. Wash your hands carefully after handling milkweed pods. If milkweed sap gets into your eyes or that of a fellow collector, seek medical attention immediately. If you know you have an allergy to latex, be sure to protect your skin and eyes from the sap. 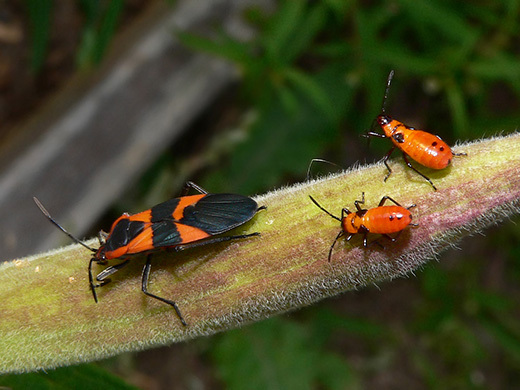 Milkweed bugs use their beak or rostrum to pierce and feed on milkweed seeds rendering them inviable. The damage is often difficult to see. Do not collect open pods with numerous milkweed bugs on the seeds or pods. Avoid introducing milkweed bugs into the bags in which you are placing pods. After you have made your collection, spread out the pods and remove any milkweeds bugs you find on the pods or seeds. The pods can then be re-bagged in the onion bags and hung up to dry. Inspect the bags from time to time to be sure that no milkweed bugs have been missed during your inspections. Large milkweed bug (Oncopeltus fasciatus) adult and two juveniles. Photo by Greg Hume. These bugs are seed feeders and destroy milkweed seeds. Avoid collecting and storing these insects with seeds or seed pods.